We are a co-operative community providing affordable, family-oriented housing. Our waiting list is currently closed. If you have an application on file already, please remember to keep it up to date. Thank you for your interest in joining our community! Our external waitlist application is now closed. 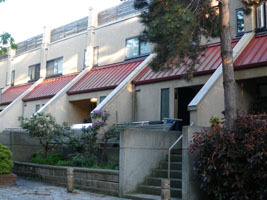 The False Creek Co-operative Housing Association (FCCHA) was founded in 1974 on the motto "People Helping People". We have since, through participation, responsibility and good neighbouring amongst the members, been able to sustain affordable housing at a prime location in Vancouver. Our co-op functions through "co-operative spirit" and the involvement of its members on the Board of Directors and the following committees: Finance, Membership, Internal Building Maintenance, External Building Maintenance, Grounds/Gardening (Enclave 5 and 6), Newsletter, Move in-Move out, Apartment Housing, Communal Space, Website and Parking. One of the principles established when the FCCHA came into existence was the belief that the co-op should not be a form of rental housing. Instead, it is a form of home ownership, providing many benefits to the members, but at the same time also requiring certain commitments from those members in the form of participation that makes our community viable, safe and fun to live in. Our co-op exists to serve its members. Housing co-ops offer affordable housing and build communities where members contribute in support of each other. Good governance ensures that there is ethical guidance and structures and processes in place to keep the purpose of the organization in focus and to ensure it has the resources to achieve its purpose. Good management ensures that the people, tools and skills are in place to get needed jobs done. Members ensure good leadership by electing a Board of Directors from among themselves annually and participating in deliberations and decision making. At False Creek Housing Co-op, we promote a healthy community that contributes to everyone’s well being through friendly interactions in our day-to-day contacts and through attention to the work of governing the organization. 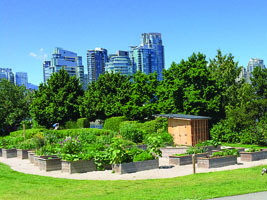 The False Creek Co-operative Housing Association aspires to create an inclusive, respectful community that is economically, environmentally, and socially sustainable. Our co-op is situated around Charleson Park in the False Creek South neigbourhood of Vancouver. We are divided into two enclaves with a total of 170 units. 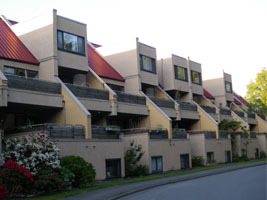 Enclave 5 has 82 units and is situated east of Charleson Park. Enclave 6 has w88 units and is west of the park. The two enclaves are slightly different; each has a slightly different layout and combination of units. In Enclave 6 there are 2, 3 and 4 bedroom units, a playground and a communal space. Enclave 5 also has 2, 3, and 4 bedroom units plus a building with 1 and 2-bedroom apartments, a communal space, and the office.